The small edible oil refinery plant, as a small refinery plant, is mainly used for making the crude oil into edible oil. Just as cottonseed oil, only through the refining processing, can it be eaten as edible oil. Commonly, refining is the process of removing impurity out of the cooking oil, which including free fatty acids, phosphatides, waxes etc. 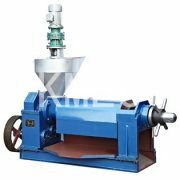 Also, the refining processing helps remove the coloring pigments and the bad smell in the oil. 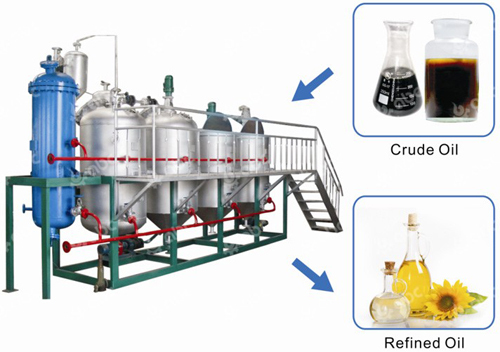 The edible oil refining consists of five steps. But for the crude oil types and different requirements from clients, the processes are not the same exactly. The degumming processing is one of the most important step in the edible refining, the effective degumming help to improve the quality of the finished edible oil reducing loose of the oil. Aqueous method is used in this processing by using the phospholipids to make the colloid absorb water and cohere thus the colloid can be separated from the crude oil. The neutralizing process, is also called de-acidification meaning that adding alkali in the oil to neutralize the free fatty acid of the crude oil. After this process, the stability of the finished oil will be prolonged to be easily stored. For the bleaching process, there are various methods in the industry, the most widely used method is absorption de-colorization. This processing is adding surface active material with high absorbing ability like natural drifts oil, active clay, activated carbon into the oil to absorb the pigment and other impure matters of the neutralized oil to meet purifying. Deodorization process lies in removing the smell of oil by using the vacuum steam deodorization, the principle is relying on the steam distillation in the high temperature and high vacuum condition. The related equipment is the deodorizing tank. Another step is the dewaxing processing, because some of oil like corn oil and sunflower oil have wax in side. The usual methods are alkali refining, conventional method, surfactant and coagulant method etc. Speaking of building a small edible oil refinery, people will ask how much are the equipment firstly. Actually, many elements influence the small edible oil refinery plant cost except of the equipment price. The most important element influencing the small edible oil refinery plant cost is the crude oil. For different kinds of crude oil, the refining processes are not the same exactly. For instance, refining the corn crude oil and the sunflower crude oil, due to the wax may exist in these crude oil, when processing these crude, dewaxing processing should be operated. Thus, the finished edible oil looking shiny can get the customers’ favors. Next, the workshop area. Generally, for small edible oil refinery plant, it does not need a very big place. There are still some manufacturers, their equipment take large space that will take a large space. Water and electricity consumption. The energy consumption is another big cost in the processing. Some related equipment with over-high power may cost high consumption. The labor. The installation, debugging, operating of the equipment need labors. Usually, the manufacturers will send professionals to install and debug the equipment for the customers. While equipment with simpler structures are easier to operate while needing less labors. Care and maintenance. The material and quality of the equipment also influence the small edible oil refinery plant cost. 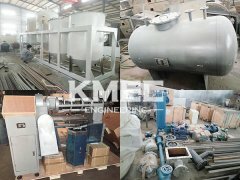 Most of refining plant is made of carbon steel, but some customers demand the stainless steel which will increase the cost definitely. Besides, some manufacturer may adopts thin steel plate which can not serve long time thus increasing the maintenance cost. How to reduce the small edible oil refinery plant cost? The small edible oil refinery plant cost is the most important things that the clients concerned about. Absolute low cost does not exist, including the small edible oil refinery plant. But relative low cost of the small edible oil refinery plant can be realized. Finding the reliable manufacturers who has been in this industry for long time. 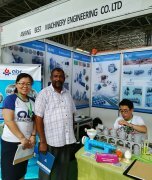 They posses more professional technology and richer experience of building a small edible oil refinery, also their quality definitely had been recognized by the public. Want to know more information about this edible oil refinery? Please contact us, telling us your requirement, we can offer you detailed business plan for setting up a small edible oil refinery plant with the most competitive cost.